In our version of the activity, we put students in groups of three and give them a few minutes to come up with three to four topics they all find interesting. Sometimes students need a few ideas to get them started so we list some examples on the board (animals, sports, music, fashion, etc.). Then we tell students to select one of the topics – preferably the one they know the most about – and to develop a top five list for this topic. Some examples might be top five animals, top five sports cars, top five musical artists, or top five movies. 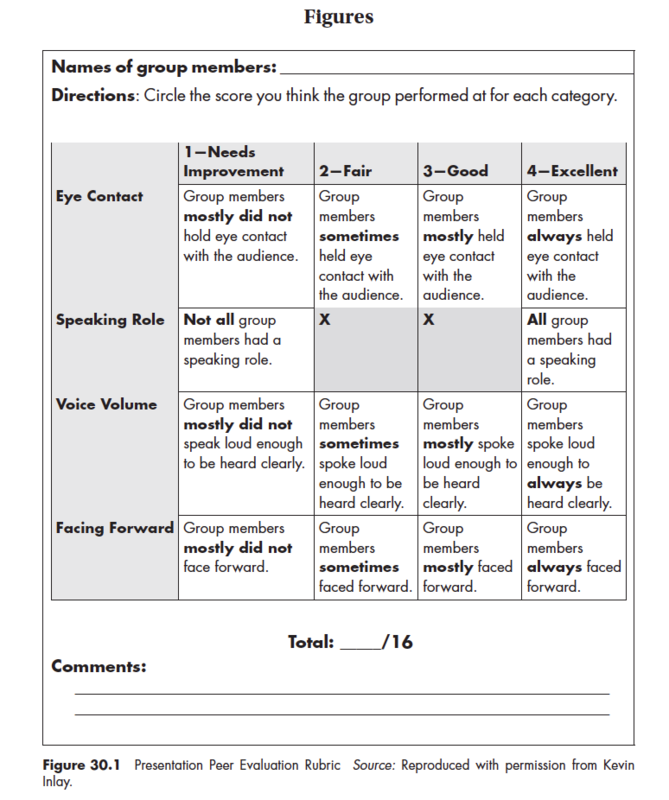 Students then receive Figure 30.5: Top Five Outline(depending on the proficiency level of students, the teacher can choose to include or not to include the sentence frames). PechaKucha (“chit-chat” in Japanese) is a popular presentation format in which 20 slides are shown for 20 seconds each (20 × 20) – about six and a half minutes. The slides, which usually contain one to two images and minimal text, are programmed to advance automatically as the speaker talks along with them.